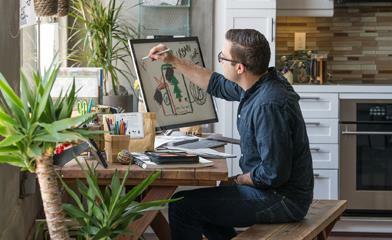 Sway has started rolling out to Office 365, added more languages, and more! 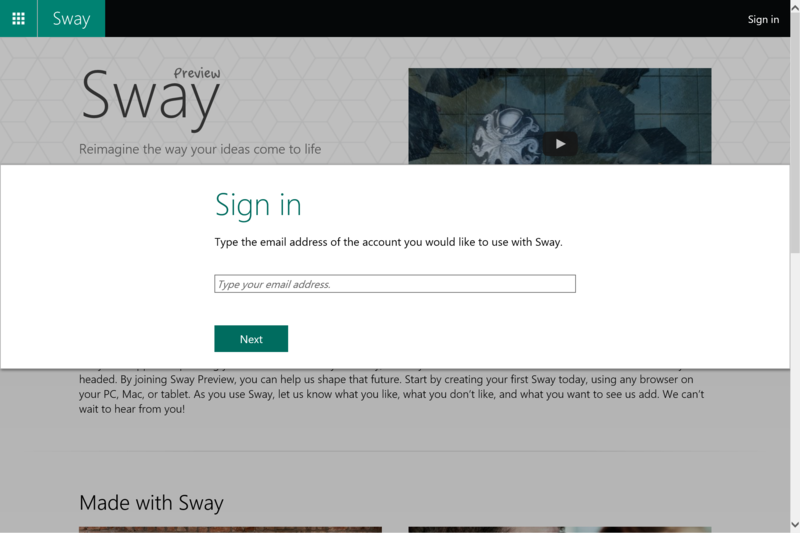 It’s been an exciting month for Sway and our journey with Sway Preview! At the Ignite conference, we announced that Sway would roll out to Office 365 business and education customers and add support for more languages. Today we’re excited to announce the start of these rollouts, as well as other changes that expand the type of content you can add and the ways you can visualize the multimedia that brings your Sways to life. Check out the details below! Today, we’re beginning the rollout of Sway to qualified Office 365 business and education customers. This opens the door for many new people to use Sway at work and school, and we’re excited to get a whole new set of feedback from these customers as part of Sway Preview! We even have a dedicated UserVoice forum for feedback on the Sway for Office 365 experience. As mentioned earlier this month, Sway for Office 365 is initially rolling out to First Release customers, and it will become available to all eligible Office 365 customers over the coming months. Today’s rollout includes support in Sway on the web for Office 365 work and school credentials, with the next update to Sway for iPhone supporting these accounts as well. Sway on the web now also has a simplified sign in interface that provides the corresponding Sway experience for you, depending on whether you sign in with a Microsoft account or an Office 365 work or school account. Sway.com now has a simplified sign in experience. With Sway for Office 365, professionals can save time at work and easily create engaging, eye-catching interactive reports, presentations, and more which flow responsively across all device types. 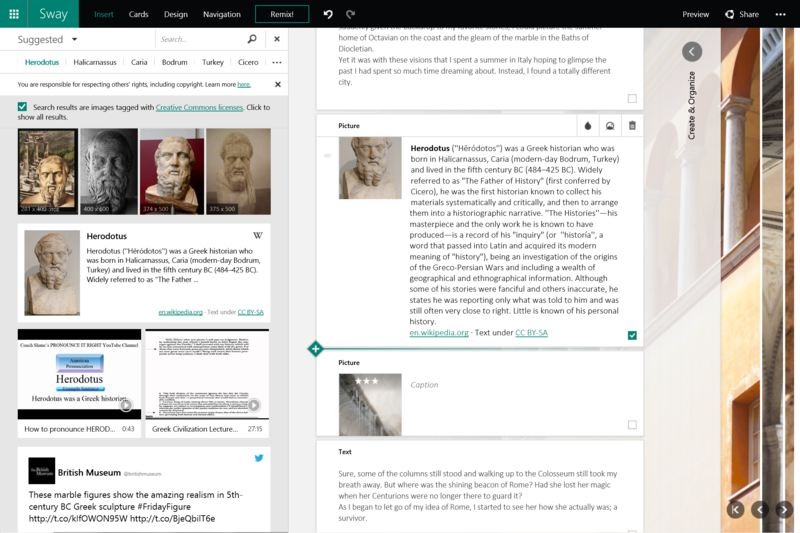 Teachers can use Sway to engage students, faculty and parents with interactive lessons, assignments, project recaps, newsletters and more. 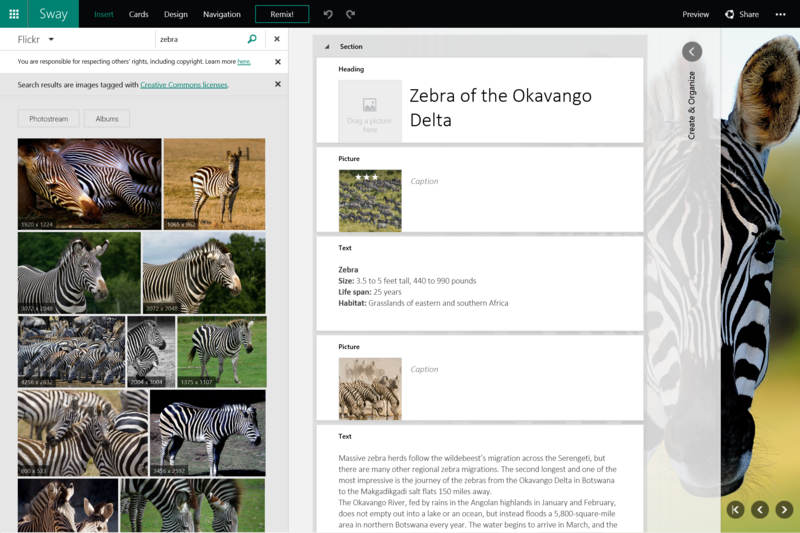 Students can have fun while learning and stay engaged by using Sway to breathe new life into reports, assignments, projects, study materials, and portfolios. If your organization is not already in First Release, Office 365 admins can visit the Office 365 admin center (under Service settings > Updates) and select either Entire organization or Select people to turn First Release on. The setting change can take up to 24 hours to take effect. At that point, Sway will begin to roll out to your organization. Also as promised earlier this month, Sway on the web now supports six more languages, for both consumers and Office 365 business and education users. Now you can use the Sway web interface in Dutch, French, German, Italian, Portuguese and Spanish (in addition to English). Support for Japanese is also coming soon, with other languages to follow. Sway will automatically set its language according to your browser’s language settings, but you can change languages by adjusting your browser settings if you speak multiple supported languages. Sway for iPhone will be updated soon to support these languages as well, and become available in the App Store for markets where those are official languages. Suggested searches in Sway helps you while you create by anticipating what content you might want to incorporate. It uses natural language processing to continuously show you tags for related words and phrases you might be interested in searching on, based on what you’ve already written and the specific content in the area you’re working on. In March, we expanded the results of Suggested searches to include YouTube videos and tweets, in addition to images from Bing Image Search. Now, Suggested search results include Wikipedia snippets that you can easily add to your creation to complement the other multimedia you use to share your narrative. For example, let’s say you’re creating a Sway about ancient history and use Suggested searches to find additional information about famous historians and philosophers—including Herodotus. As long as a Wikipedia article exists, and it has an infobox containing an image (an infobox is the small fact table on the right side of many Wikipedia articles), the Suggested search results will include a Wikipedia article abstract. Then you can easily add that snippet to your Sway, which brings the snippet’s picture together with the Wikipedia article’s first paragraph as its caption, as well as a citation. 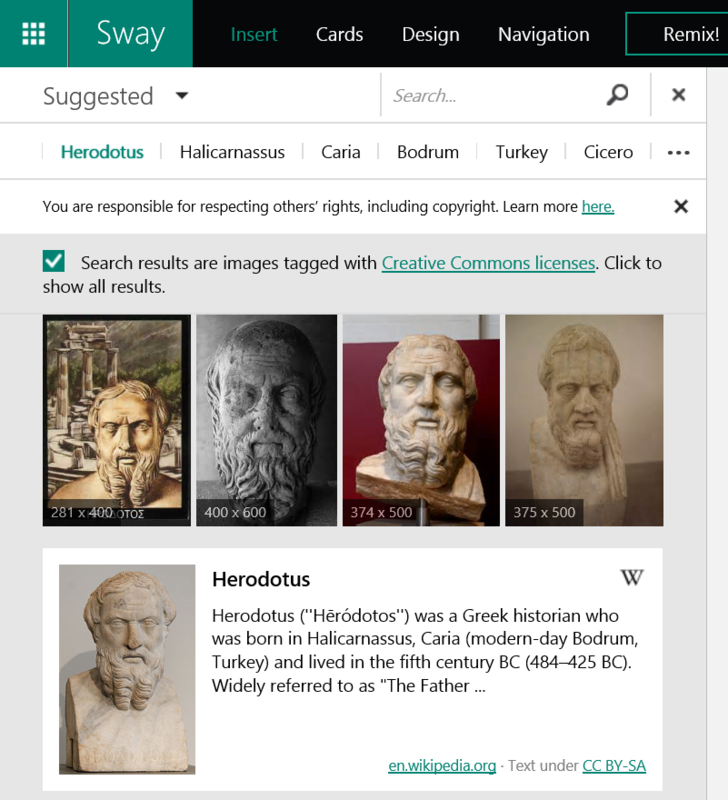 Sway’s Suggested search results can now include Wikipedia snippets containing an image and article abstract. Sway makes it easy for you to pull together your rich multimedia content from a variety of sources, right within the app. Millions of people use Flickr to store and share their images in its community. 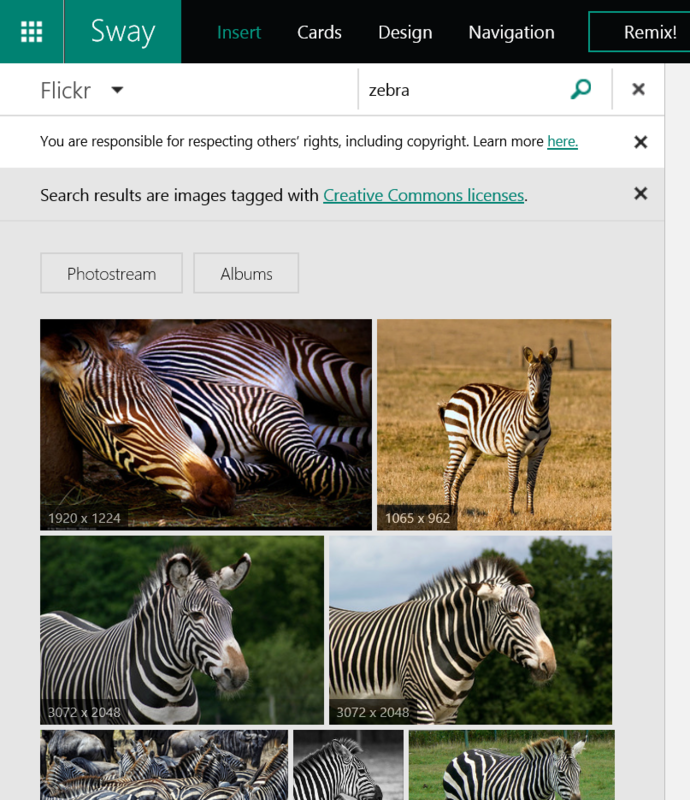 By integrating Flickr into the consumer version of Sway, now you can easily access your Flickr images and quickly drag and drop them right into your creations. And that is not all! If you don’t have a Flickr account, you can still search for community images tagged with Creative Commons licenses. Sway now lets you browse your personal images from Flickr, as well as searching Flickr community images (shown). Get started by selecting Flickr from the Insert tab. Then search for images using the search box. You can also connect to your Flickr account right within Sway to access your personal images without leaving the app. Photostream displays all images that you uploaded to Flickr, and Albums helps you navigate individual albums you’ve created. We’ve added another powerful way to visualize and structure your multimedia content in Sway! The new Grid Card organizes any images, videos and text you’ve added to it into a uniform grid, which will adjust automatically to look great on each screen size where it is displayed. The Grid Card can be a great way to put together a series of photos that are all similar, when you want to display them close together in your Sway, using the same size, and all on the screen at once. It’s also another great example of how Sway lets you express your intent (“keep these things together, all showing at once and visually consistent with each other”) and acts as your digital design assistant to ensure your creation looks great across devices. The new Grid Card displays your images, videos and text in a consistent grid that adapts to look great across screen sizes. There are two ways to get started. You can add a blank Grid Card from the Cards tab, and then add multimedia to it. Or, select a collection of images, videos and text you’ve already added, select Group, and then choose the Grid option that appears on the left. Sway will ensure that your images and other content look great in a Grid layout, even if they weren’t originally the same size or aspect ratio. Sway intelligently inspects and crops the images to fit in the grid, and you can also use Focus Points to help make sure what’s important shines through. We’re really excited about the new possibilities that the Grid Card provides. Give it a try and let us know what you think! Thanks for all the feedback you’ve been providing during our Sway Preview journey together. Please keep it coming! 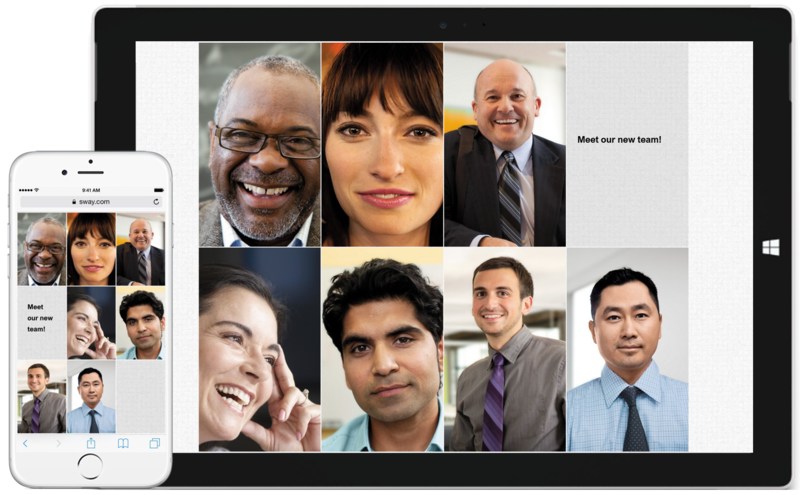 And welcome to all of our new Sway for Office 365 users! As always, feel free to drop us a line on UserVoice.